Varanasi (India) (AFP) - A stampede at a religious gathering in northern India killed at least 24 people Saturday as thousands of devotees of a controversial guru tried to cross a bridge at once, police said. 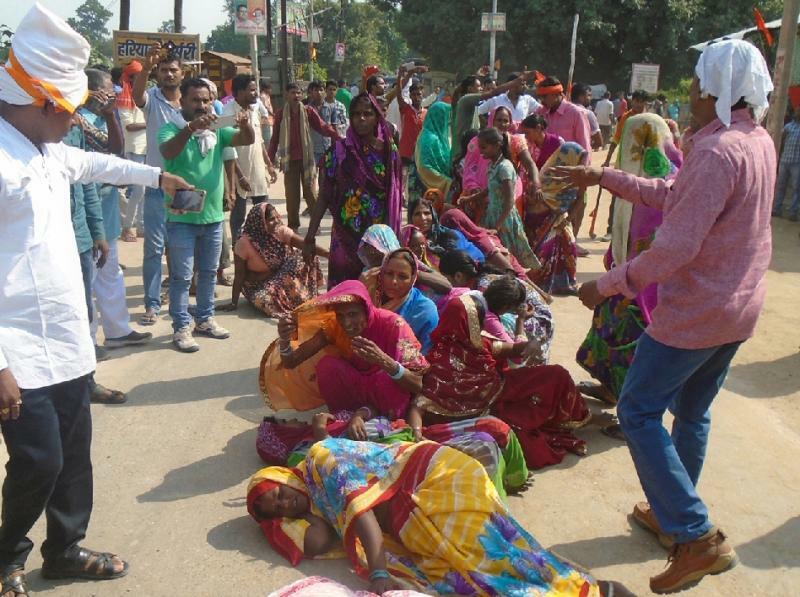 The followers of Jai Gurudev, a leader of a local religious sect, had gathered on the outskirts of Varanasi, a Hindu holy town in Uttar Pradesh state, when the deadly stampede broke out. "We can confirm that 24 people have died in the incident. Nineteen of the dead are women," Hari Ram Sharma, police inspector general, told reporters in the state capital Lucknow. At least 20 others were injured in the crush and were undergoing treatment at nearby hospitals. State police chief Javeed Ahmed blamed overcrowding on the old iron bridge for the disaster. "They had sought permission for 5,000 persons but many more people reached and joined the procession," Ahmed told India's NDTV news network. "They were crossing a bridge when some rumour-mongering happened which led to the disaster." A spokesman of the religious sect said the stampede occurred after a rumour spread that the narrow bridge had collapsed, the Press Trust of India (PTI) news agency reported. "The devotees were proceeding towards the camp (across the river) but police started sending them back. This led to rumours that the bridge has collapsed," Raj Bahadur told PTI. TV footage showed piles of colourful clothing and slippers lying in a heap with policemen trying to clear the debris. "There was a lot of chaos, all of us were pushed and shoved. Many people have died including my mother," a witness told reporters as ambulances sped by. Devotees from nearby districts had gathered for the two-day religious congregation on the banks of river Ganges. State Chief Minister Akhilesh Yadav has ordered a high-level enquiry into the tragedy while announcing monetary compensation for the victims, his spokesman Rajendra Chaudhary said. Stampedes at India's religious festivals, where police and volunteer stewards are often overwhelmed by the sheer size of the crowds, are not uncommon. In July last year, a stampede on the banks of a holy river killed 27 pilgrims in southern India. 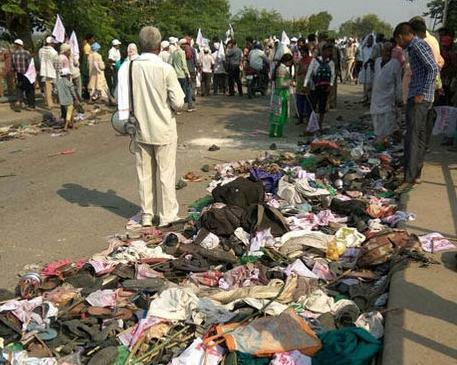 Around 115 people were killed in October 2013 at a stampede near a temple in the central state of Madhya Pradesh, site of another deadly stampede there seven years earlier. Jai Gurudev, who died in 2012, is among several charismatic self-styled "godmen" who enjoy a cult-like following among thousands of followers. Typically clad in white robes and turban, Gurudev fiercely espoused vegetarianism and claimed "to liberate the soul from the rotation of birth and death" on his website. In June, a breakaway sect of his followers were involved in a riot in Mathura city which killed 24 people. Indian Prime Minister Narendra Modi said he was saddened by the loss of life in the latest incident. "I have spoken to officials & asked them to ensure all possible help to those affected due to the stampede in Varanasi," Modi tweeted.